Grapefruit is found in the southern states or southern western states. If you happen to live in the area for citrus and have trees in your yard, you probably will want to learn to can the fruit. You will see more citrus than you can eat during the harvest season. We are going to can grapefruit in segments here but you can also make juice to can as well as other grapefruit recipes. If you have never canned before, you are going to need to acquire some things that you don't normally find in your kitchen. 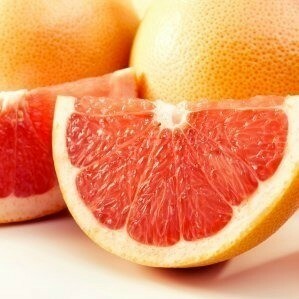 You need to pick firm grapefruit with a good yellow color. It needs to be ripe when you can it. There shouldn't be any discolored peel or bad spots in the fruit. You will need to decide if you want red or white grapefruit. Do you want just one colored fruit or do you want to mix them? The grapefruit needs to be washed in cool or lukewarm water. Let it dry as you get the jars ready. Peel the grapefruit. You can peel the grapefruit with your hands if you want. I drop citrus fruit into boiling water for about a minute. The peel won't slide off like it does with other fruit but it will loosen the white membrane from the fruit. I also use a citrus peeler to peel my grapefruit. A citrus peeler can be found in a kitchen store with the gadgets. It looks like a crochet hook. You hook the hook-like end under the skin where the stem was and pull the peeler straight down to the bottom. Make three more cuts causing the skin to be opened in quarter pieces. Use the other end of the peeler like you do your fingernails to pries the skin away from the fruit. Pull down and the skin should come right off. Separate the fruit into segments. Be sure to remove all the white from the grapefruit. Use your kitchen scissors to cut out the hard white in the middle of the segments. You can take out the seeds if you want to. While the syrup is cooking, fill the jars. Bring the grapefruit to 1/2 inch from the top of the jar, this is headspace. Next pour the syrup gently over the fruit. Keep the headspace to 1/2 inch. Run a plastic spatula around the side of the jar to break up any air bubbles. Be sure to wipe off the jar top before placing the lid on the jar. Add the band and tighten the top snuggly. Don't try to make it so tight no one can get it off. Just make it snug. The jars are ready for the canner. The water should be boiling. Use the jar grabber to lower your jars into the water. Be sure the water is 1 inch above the jar tops. Add more boiling water if the water steams away before the processing is finished. Process for 10 minutes. Once processed, remove jar from boiling water and place on a thick towel on the counter. Be sure to leave some space between jars to help the cooling process. Once they are cool, check the seal. If you push the tops and the lids try to pop up and down, the seal is not good. Put unsealed jars in the refrigerator and use quickly. Once the jars are sealed and cool, place them in a dark, cool place. You are done.